This is a very odd-shaped piece of land bordered by Republic, Walker, and 1st Street NW. 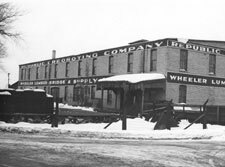 In 1950 Wheeler Bridge Lumber Supply acquired land adjacent to the Republic Creosoting Co. and built a new office building. The company goes back to at least 1911 as the Wheeler-Timlin Lumber Company. They moved from the Lumber Exchange Building in Minneapolis to their new offices in 1951. The company treated bridge timbers as long as 40 ft. long. In a 1964 article, Carl T. Jensen, executive vice president explained: “It takes about 24 hours, under pressure, and a gallon of preservative oil to every cubic foot of wood to treat bridge lumber.” Fir and pine are the principal types of wood used. After many changes, the company, by then known as Erickson Engineering and Highway Products, moved to Bloomington. The building was purchased by Anderson-KM Builders in 2007 for $570,000 with the intent to construct an office building on the site. The original building was demolished in 2008 but the development plans fell through.